For ductility in Earth science, see Ductility (Earth science). “Malleability” redirects here. For the property in cryptography, see Malleability (cryptography). Ductility is a measure of a material’s ability to undergo significant plastic deformation before rupture, which may be expressed as percent elongation or percent area reduction from a tensile test. According to Shigley’s Mechanical Engineering Design (10th Ed.) significant denotes about 5.0 percent elongation (Section 5.3, p. 233). See also Eq. 2–12, p. 50 for definitions of percent elongation and percent area reduction. Ductility is often characterized by a material’s ability to be stretched into a wire. 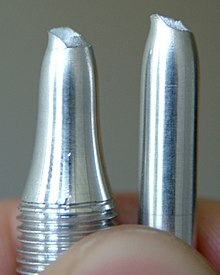 From examination of data in Tables A20, A21, A22, A23, and A24 in Shigley’s Mechanical Engineering Design, 10th Edition, for both ductile and brittle materials, it is possible to postulate a broader quantifiable definition of ductility that does not rely on percent elongation alone. In general, a ductile material must have a measurable yield strength, at which unrecoverable plastic deformation begins (see Yield (engineering)), and also must satisfy one of the following conditions: either have an elongation to failure of at least 5%, or area reduction to rupture at least 20%, or true strain to rupture at least 10%. Malleability, a similar property, is a material’s ability to deform under compressive stress; this is often characterized by the material’s ability to form a thin sheet by hammering or rolling. Both of these mechanical properties are aspects of plasticity, the extent to which a solid material can be plastically deformed without fracture. Also, these material properties are dependent on temperature and pressure (investigated by Percy Williams Bridgman as part of his Nobel Prize-winning work on high pressures). Ductility and malleability are not always coextensive – for instance, while gold has high ductility and malleability, lead has low ductility but high malleability. The word ductility is sometimes used to encompass both types of plasticity. Gold is extremely ductile. It can be drawn into a monatomic wire, and then stretched more before it breaks. Ductility is especially important in metalworking, as materials that crack, break or shatter under stress cannot be manipulated using metal-forming processes such as hammering, rolling, drawing or extruding. Malleable materials can be formed cold using stamping or pressing, whereas brittle materials may be cast or thermoformed. High degrees of ductility occur due to metallic bonds, which are found predominantly in metals, leading to the common perception that metals are ductile in general. In metallic bonds valence shell electrons are delocalized and shared between many atoms. The delocalized electrons allow metal atoms to slide past one another without being subjected to strong repulsive forces that would cause other materials to shatter. 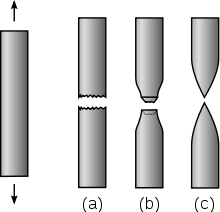 Ductility can be quantified by the fracture strain , which is the engineering strain at which a test specimen fractures during a uniaxial tensile test. Another commonly used measure is the reduction of area at fracture . The ductility of steel varies depending on the alloying constituents. Increasing the levels of carbon decreases ductility. Many plastics and amorphous solids, such as Play-Doh, are also malleable. The most ductile metal is platinum and the most malleable metal is gold. When highly stretched, such metals distort via formation, reorientation and migration of dislocations and crystal twins without noticeable hardening. Schematic appearance of round metal bars after tensile testing. The ductile–brittle transition temperature (DBTT), nil ductility temperature (NDT), or nil ductility transition temperature of a metal is the temperature at which the fracture energy passes below a predetermined value (for steels typically 40 J for a standard Charpy impact test). DBTT is important since, once a material is cooled below the DBTT, it has a much greater tendency to shatter on impact instead of bending or deforming. For example, zamak 3 exhibits good ductility at room temperature but shatters when impacted at sub-zero temperatures. DBTT is a very important consideration in selecting materials that are subjected to mechanical stresses. A similar phenomenon, the glass transition temperature, occurs with glasses and polymers, although the mechanism is different in these amorphous materials. In some materials, the transition is sharper than others and typically requires a temperature-sensitive deformation mechanism. For example, in materials with a body-centered cubic (bcc) lattice the DBTT is readily apparent, as the motion of screw dislocations is very temperature sensitive because the rearrangement of the dislocation core prior to slip requires thermal activation. This can be problematic for steels with a high ferrite content. This famously resulted in serious hull cracking in Liberty ships in colder waters during World War II, causing many sinkings. DBTT can also be influenced by external factors such as neutron radiation, which leads to an increase in internal lattice defects and a corresponding decrease in ductility and increase in DBTT. The most accurate method of measuring the DBTT of a material is by fracture testing. Typically four point bend testing at a range of temperatures is performed on pre-cracked bars of polished material. For experiments conducted at higher temperatures, dislocation activity increases. At a certain temperature, dislocations shield the crack tip to such an extent that the applied deformation rate is not sufficient for the stress intensity at the crack-tip to reach the critical value for fracture (KiC). The temperature at which this occurs is the ductile–brittle transition temperature. If experiments are performed at a higher strain rate, more dislocation shielding is required to prevent brittle fracture, and the transition temperature is raised. ^ a b Budynas, Richard G. (2015). Shigley’s Mechanical Engineering Design—10th ed. McGraw Hill. p. 233. ISBN 978-0-07-339820-4. .
^ Rich, Jack C. (1988). The Materials and Methods of Sculpture. Courier Dover Publications. p. 129. ISBN 978-0-486-25742-6. .
^ “Ductile”. TheFreeDictionary.com. Farlex. Retrieved January 30, 2011. Includes definitions from American Heritage Dictionary of the English Language, Collins English Dictionary: Complete and Unabridged, American Heritage Science Dictionary, and WordNet 3.0. ^ Masuda, Hideki (2016). 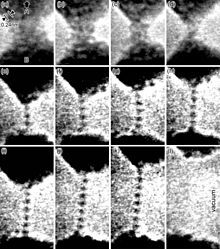 “Combined Transmission Electron Microscopy – In situ Observation of the Formation Process and Measurement of Physical Properties for Single Atomic-Sized Metallic Wires”. In Janecek, Milos; Kral, Robert. Modern Electron Microscopy in Physical and Life Sciences. InTech. doi:10.5772/62288. ISBN 978-953-51-2252-4. ^ Vaccaro, John (2002) Materials handbook, Mc Graw-Hill handbooks, 15th ed. ^ Schwartz, M. (2002) CRC encyclopedia of materials parts and finishes, 2nd ed. ^ John, Vernon (1992). Introduction to Engineering Materials, 3rd ed. New York: Industrial Press. ISBN 0-8311-3043-1.